Everyone at OC Lifesmiles Progressive Dentistry understands how frustrating it can be to have a lackluster smile due to missing teeth. That is why we will do everything in our power to enhance your smile. Dental implants are a popular restorative procedure that can permanently replace missing teeth. Cosmetic dentist John Cross, DDS uses state-of-the art technology to personalize the size, shape, and color of your dental implants so they can blend in seamlessly with your teeth. In comparison to dentures, dental implants are unable to move or slip along your gum line since they are permanently rooted into your jawbone. Dental implants are designed to replace a single missing tooth or anchor a larger restoration such as a bridge or denture. A single tooth implant is comprised of a titanium post that serves as the new tooth’s root as well as a custom-made porcelain crown to complete the visible part of the tooth. The titanium post is strategically placed into the jaw to provide a comfortable fit with the adjacent teeth. Over several months, the titanium post fuses to the jawbone, providing exceptional support and stability for the replacement tooth. The porcelain crown that is attached to this titanium post is customized for each patient to blend seamlessly with the surrounding natural teeth for beautiful results. The process for anchored bridges and implant supported dentures is similar, beginning with the placement of one or more dental implants. Once the implants fuse to the jawbone, the custom restoration can be attached, eliminating the need for pastes or adhesives like those used with traditional dentures. Whether you are missing a single tooth, several teeth, or if you are looking for a more natural and convenient alternative to traditional dentures, dental implants can rejuvenate your smile and restore both form and function to your teeth. Ideal dental implant candidates will have good overall health, healthy gum tissue, a fully developed jawbone, and sufficient jawbone density to receive the implant. Patients who take medications that can complicate the healing process, as well as those who suffer from certain health conditions and individuals who are undergoing radiation or chemotherapy, may not be good candidates for this surgery. Our dentist can recommend alternatives for patients who are not candidates for dental implants. During the consultation process, Dr. Cross, will perform an oral exam, review your medical history, and discuss your personal goals, allowing you to make a well-informed decision about your oral health. Dental implants are considered safe medical devices and are consistently placed with high rates of success; however, as with any procedure, the safety and efficacy implant dentistry relies largely on the skill, experience, and expertise of the dentist. Dr. Cross is highly trained in the surgical placement of dental implants and values the importance of properly assessing each patient’s candidacy for the procedure prior to treatment. Ensuring patients are good candidates dramatically reduces the chances of complications and implant failure. Additionally, Dr. Cross adheres to the highest standards of safety and ethics at every stage of the implantation and restoration process to provide superior care and results. To further enhance dental implant safety, patients must also be committed to following all pre- and post-procedure care instructions, attending each follow-up appointment, and maintaining good dental hygiene. In the rare event a complication should occur, contacting our practice as soon as possible is imperative for immediate safety and long-term implant success. What Are My Dental Implant Options? Single Tooth Implants: Single tooth implants are designed to restore the integrity of the patient’s smile with results that look and feel natural. These implants function just like natural teeth and require no special maintenance. Patients can brush and floss as usual. Implant Bridges: Implant bridges are used to replace multiple missing teeth in a row. Unlike traditional bridges, implant bridges do not require the support of adjacent teeth. The bridge is anchored to the jaw by using one or more dental implants to support the restoration. This unique solution may be ideal for patients who are not candidates for several individual implants, yet still seek their strength and stability. Implant Supported Dentures: Implant supported dentures are designed to replace full arches of teeth. Using a set of implants, such as four in the All-on-4® procedure, the denture can be secured in place without the need for pastes or adhesives. Slippage, a common concern with traditional dentures, can also be eliminated. Implant supported dentures may be a good option for patients who do not have sufficient bone density for a full set of single tooth implants. Dr. Cross uses dental implants to replace the gaps in your smile caused by missing teeth. If he decides you are a good candidate for dental implants during your consultation, he will explain the procedure and answer your questions. On the day of your procedure Dr. Cross will place the implant post into your jawbone. This will serve as a strong anchor for a permanent dental crown. Once the implant has been placed, it will need to go through a process called osseointegration, which entails the fusion of the implant to the jawbone. This makes the implant a permanent part of your mouth – just like your natural teeth. Osseointegration can take a few months for the best results; however, Dr. Cross can place a temporary crown on the implant during this period. He will recommend what to eat and drink after the procedure to help the healing process. After the implant is secure, Dr. Cross will have the customized dental crown created. The dental crown will be designed to blend in with your teeth with results that look and feel natural. We will arrange periodic checkups with our office after the dental implant procedure to monitor your progress. With proper care and maintenance, high-quality dental implants can last decades—sometimes even a lifetime. Restorations are typically crafted from state-of-the-art ceramic materials, which are incredibly durable and stain-resistant over time. Depending on the type of implant restorations you have, Dr. Cross will explain any specific care instructions you must follow in order to keep them in great shape. Every dental implant procedure is customized to meet the needs of the individual patient. As a result, the cost of the procedure will vary from case to case and may be influenced by factors such as the number of implants, the location of the implant(s), and which dental implant technique is chosen. 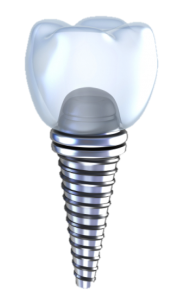 According to RealSelf, the average cost of a single dental implant in Orange County ranges from $1,200 to $2,475. At the end of your initial consultation, Dr. Cross will provide you with a quote for the total price of your dental implant procedure. Patients who might benefit from low monthly payments with little to no interest can take advantage of our financing options. To learn more about these options, please contact a knowledgeable member of our staff. Are There Alternatives to Dental Implants? During your consultation, Dr. cross will explain these options and recommend the approach that is best-suited for your needs, goals, and priorities. All bridges, dentures, and partials are custom-designed and crafted from high-quality materials to provide you with an attractive, long-lasting smile. If you would like more information about dental implants or other restorative dentistry options, please contact our practice. Dr. John Cross can develop a treatment plan with this innovative treatment to give you an amazing new smile.